To clearly explain the elements of the user interface, let’s add to the new project file a cabinet selected from the library. You can add the item from the library that we created accessed in the SketchUp dropdown menu File -> 3Dwarehause ->GetModel. This command will take you to the global 3D Warehause of components designed using SketchUp software. Having entered a keyword Bomizer in the search box and started the search, you will obtain a list of our components. Select one of the items and add it to your interior design. On the other hand, you can insert the item stored on your computer or in the library kept in the company’s server. In this case, select the item from the dropdown menu File ->Import. 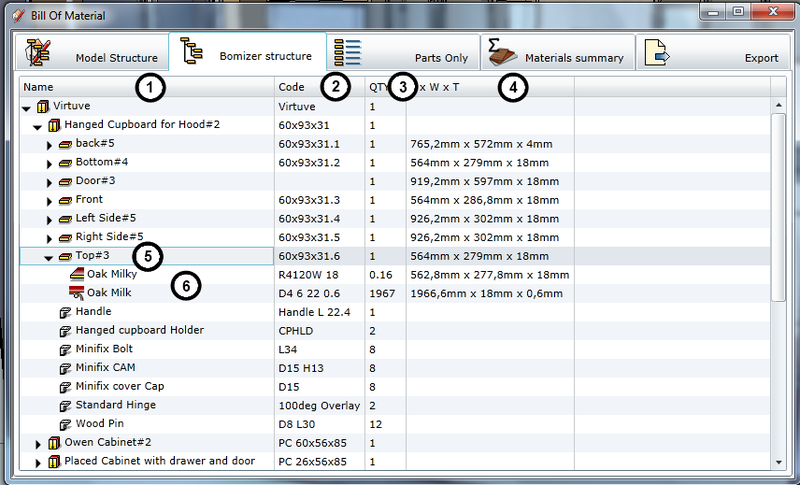 This option is illustrated in the example, where you can see how a piece of furniture with materials assigned by BOMIZER is added to the new project and BOMIZER Bill of Materials generator is opened. If this is your first visit in BOMIZER Bill of Materials generator, authorization window will be displayed. Here, you will have to provide your log-in data, i.e. Bomizer user’s e-mail address and password. ModelStructuredisplays the structure of the model, which corresponds to SketchUp component structure in the model. BomizerStructuredisplays the structure of the model while taking into account the type of component assigned by BOMIZER (normal, phantom, etc.). 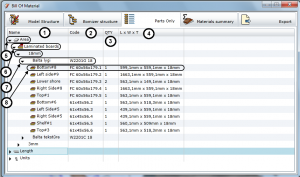 PartsOnlyprovides lists of parts grouped by type (volume, face, length, units) and material. TotalMaterialprovides the total quantity of each material in the entire model. Exportallows exporting the reports to MS Excel files. Name column specifies the name of the component. This name matches the content of the Definition Name field providing information about the component (EntityInfo). In case of dynamic component, this value includes the value of dynamic attribute Name. Code column specifies only the attribute of the dynamic component ItemCode. In case of standard component, this field is empty. 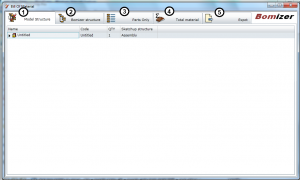 Its value is automatically entered in a different tab: Bomizer Structure. 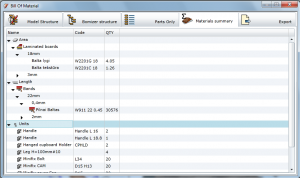 QTY column shows the number (quantity) of components added to the project. The column specifies the type of component. For information on the types of components, see the introduction of Section 2: Working with Bomizer. This is what combined component that includes other components looks like. 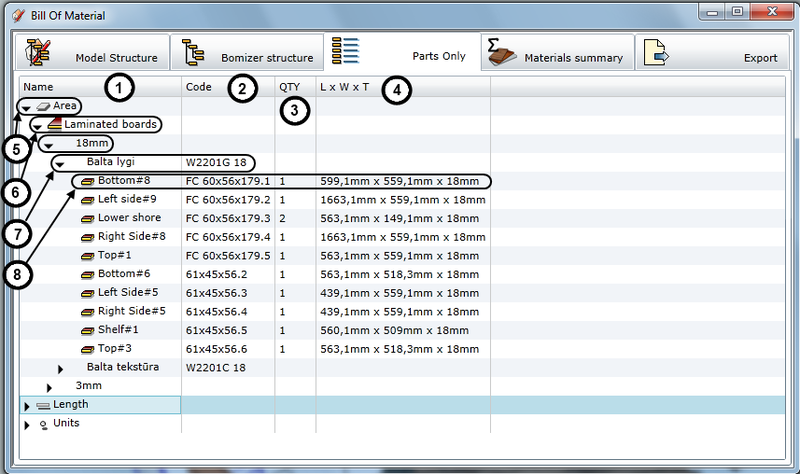 This is what component of a part that is not separated in the Bill of Materials looks like. Once you place the cursor on a node of the tree structure and right-click the mouse, you will open a context menu. Show in Sketchup: SketchUp will hide all components except for the selected one. To view the the entire structure of the project again, none of the components in SketchUp should be selected. Click the button in the BOMIZER toolbar. Select in Sketchup: selects the marked component. Expand node and sub-nodes: expands the selected node and its sub-nodes. Collapse node and sub-nodes: collapses the selected node and its sub-nodes. 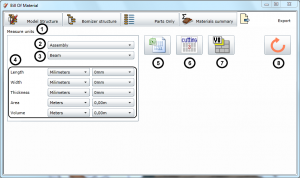 Refresh BOM: updates the information, when the geometry of the component or assignment of materials was edited without closing the window of Bill of Materials generator. 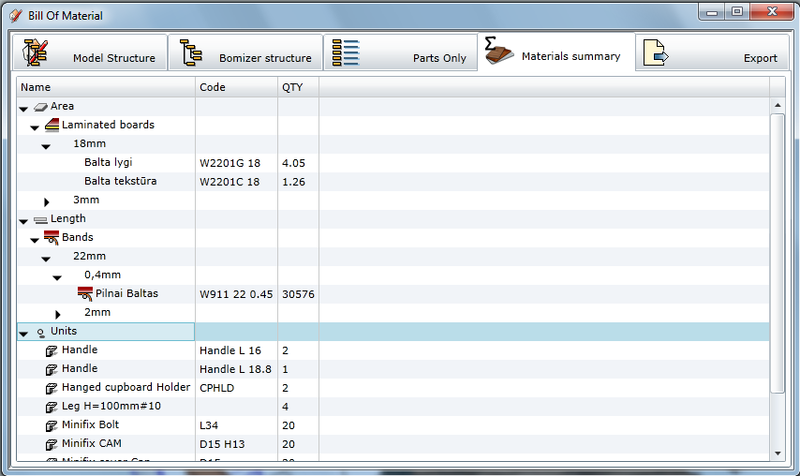 This tab shows the information used by the BOMIZER Bill of Materials generator. 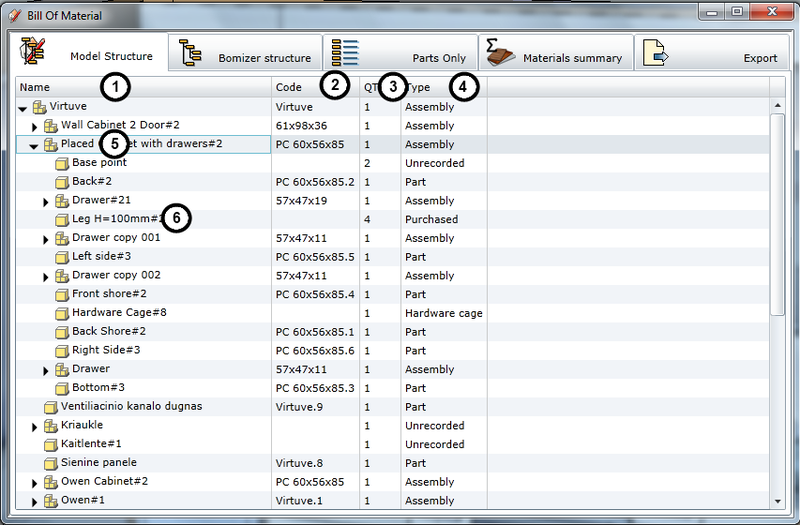 Unlike the ModelStructure window, this window does not show components that are not treated as BOMIZER components. Please note that components with materials or type of part assigned to them by BOMIZER plug-in are treated as BOMIZER components. 1. Name column specifies the name of the component. This name matches the content of the Definition Name field providing information about the component (EntityInfo). In case of dynamic component, this value includes the value of dynamic attributeName. 2. Code column specifies only the attribute of the dynamic component ItemCode. In case of standard component, this field is automatically filled in by assigning the name and code of the top node, added to the component depending on its position in the tree structure. 3. 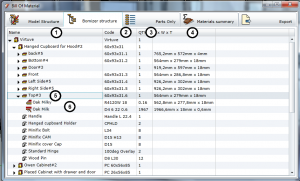 QTYcolumn shows the number (quantity) of components added to the project. 4. LxWXTcomponent specifies the size of the component. The part is included in the relevant section depending on the material assigned to the part. For example, parts made of laminated boards can be found under the heading Faces, profiles are included under the heading Lengths, etc. Parts that are described as standard purchased items are included under the heading Units. Within the section, parts are furthermore grouped by the type of material. For example, faces include Boards, Laminated Boards or Veneers. Parts are further grouped by geometric characteristics defining the material. Boards are thereby grouped by thickness, profiles – by the size of cross-section, etc. The final level specifies the material used to make the part: item No. 7 in the figure. Here, you will find a summary Bill of Materials: the quantity and type of materials necessary to manufacture the entire item or project. As with the list of parts, the materials here are grouped by the method of their recording and type of material, geometric characteristics and the specific name of the material. 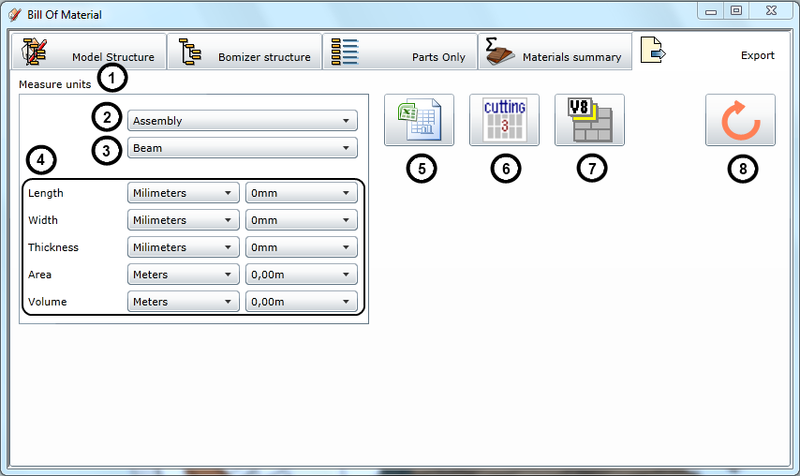 The only difference is that the final level specifies the total quantity of the material, rather than the parts. 5. MS Excel file where separate sheets with various reports on the recorded item or project are generated. 1. 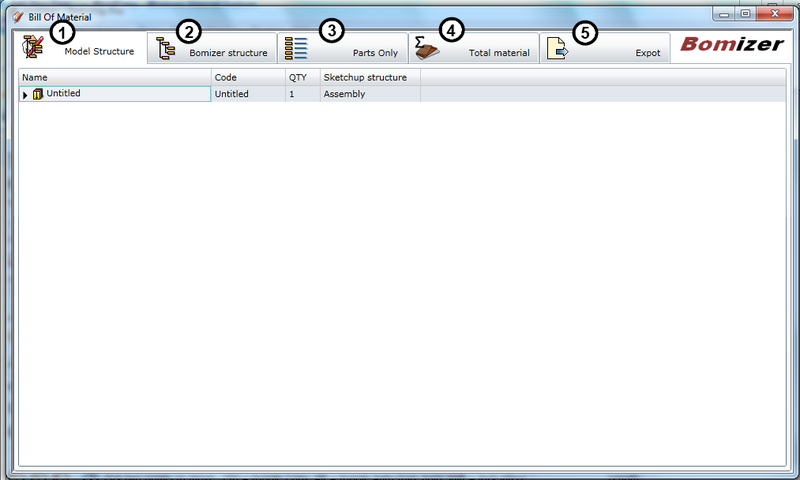 The tab window allows specifying the items of the output data. 2. 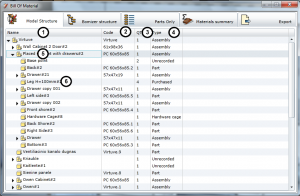 Here, you can specify the sections of the output data, display of whose items is managed. Currently, items for the following data sections can be managed.